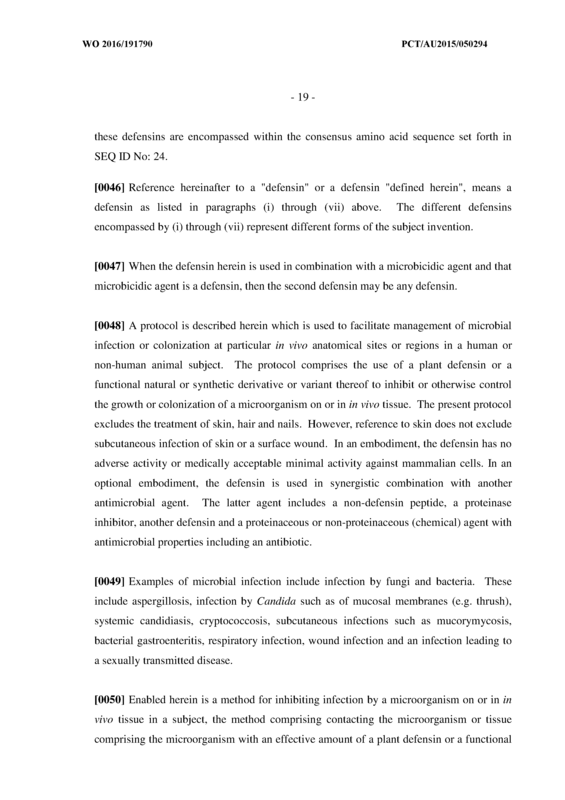 The present disclosure teaches the treatment or prophylaxis of infection by a microorganism including a fungus or bacterium which is infecting or colonizing an in vivo tissue, surface or membrane. 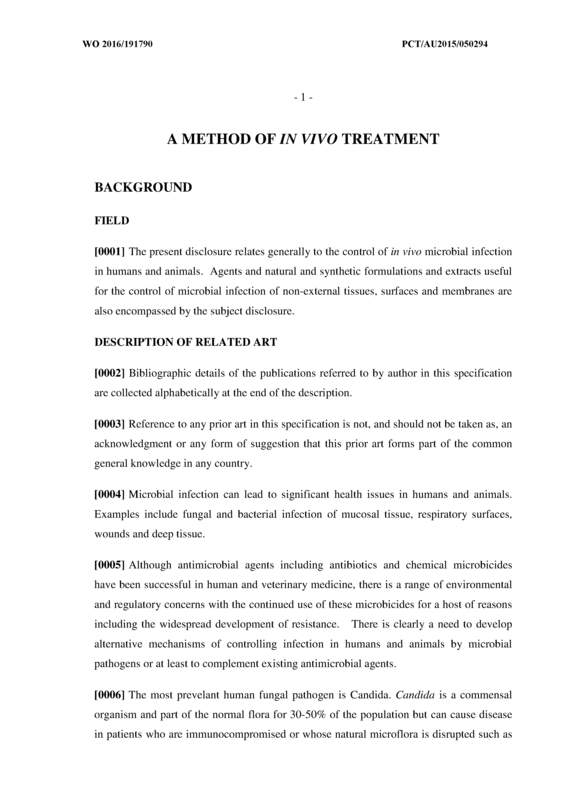 The method comprising administering to the subject with the infection or directly to the site of infection a plant-derived defensin or a functional variant or derivative thereof. 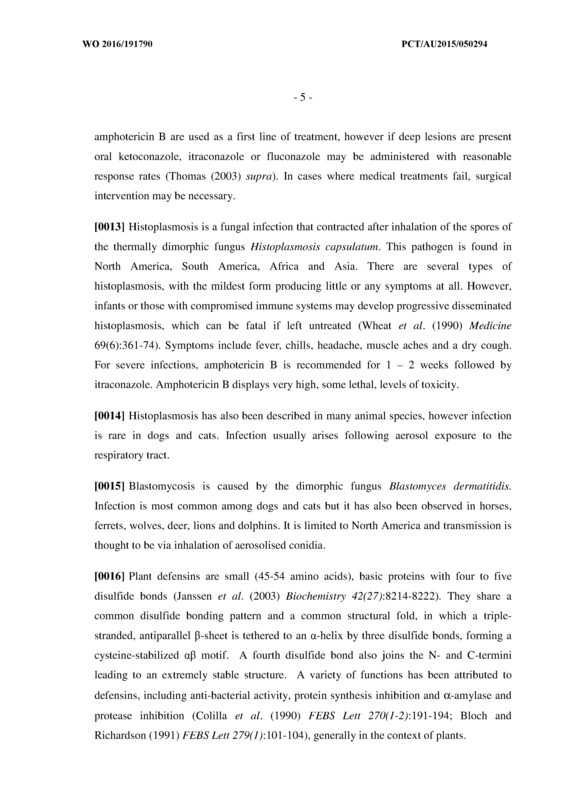 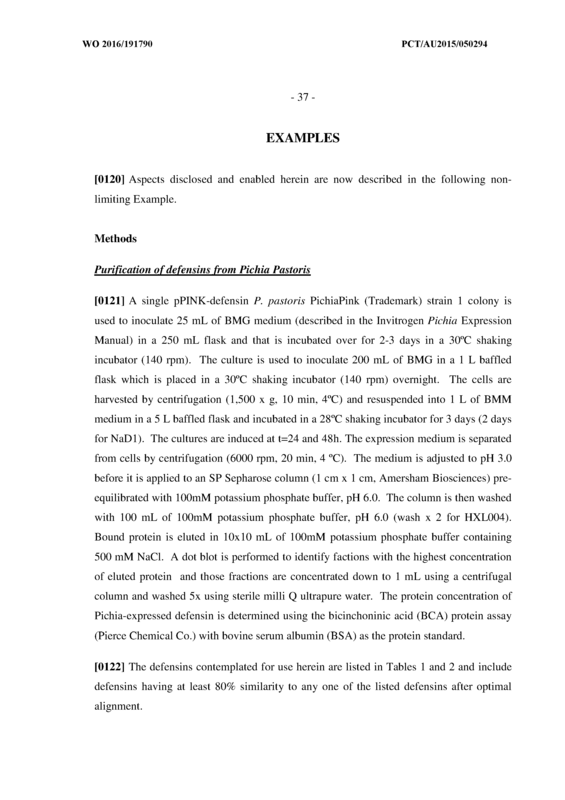 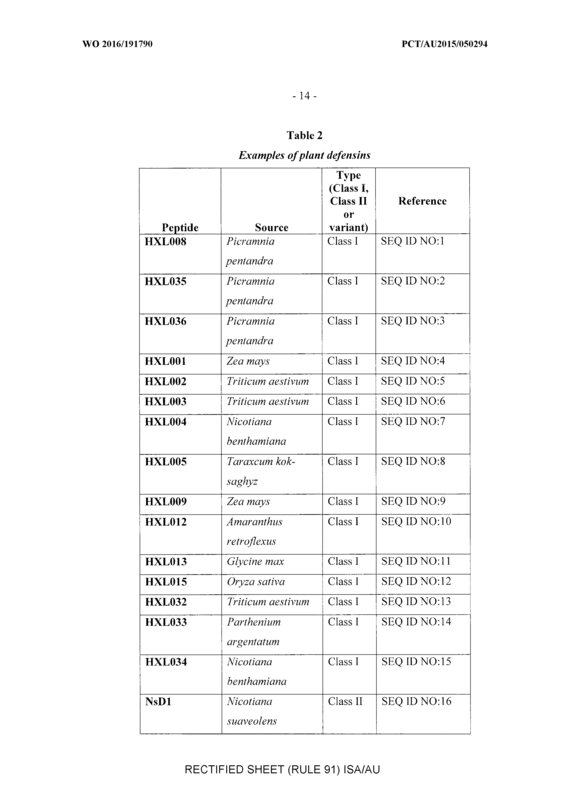 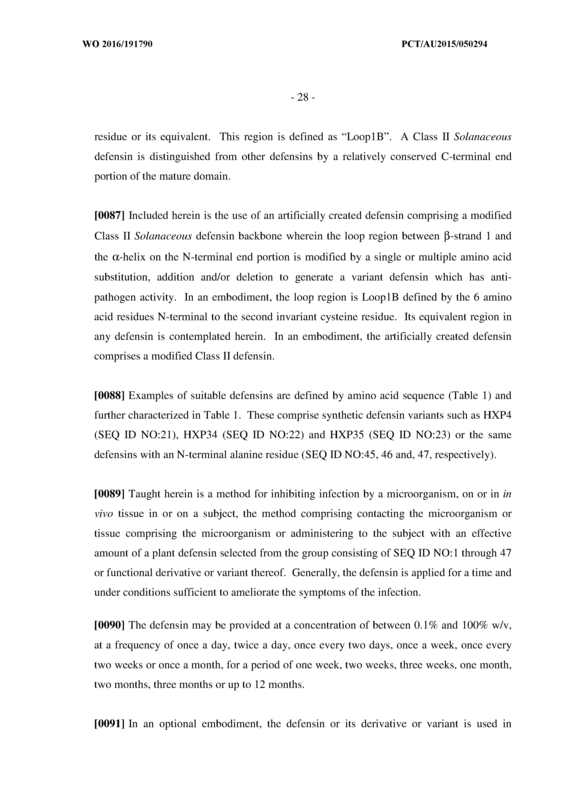 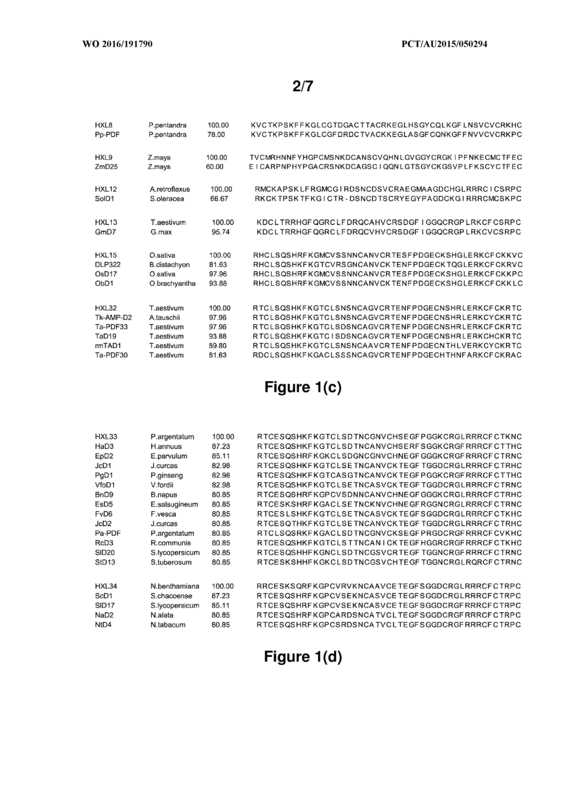 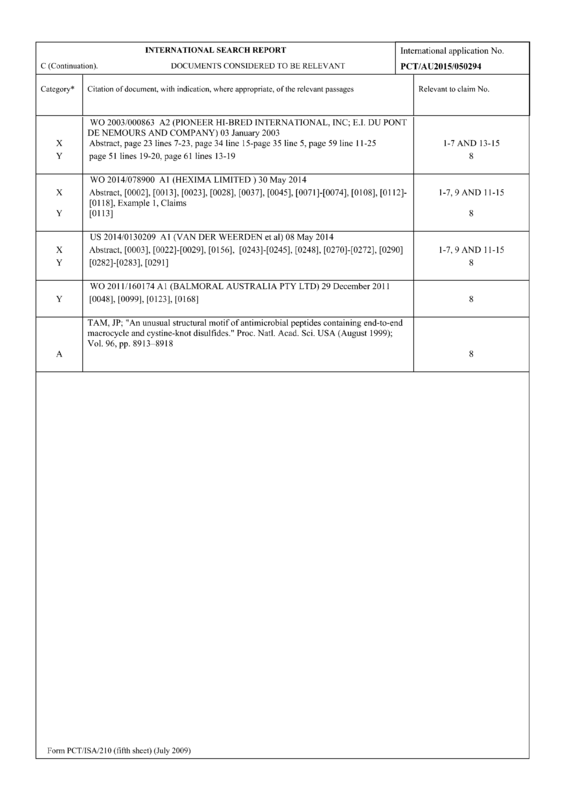 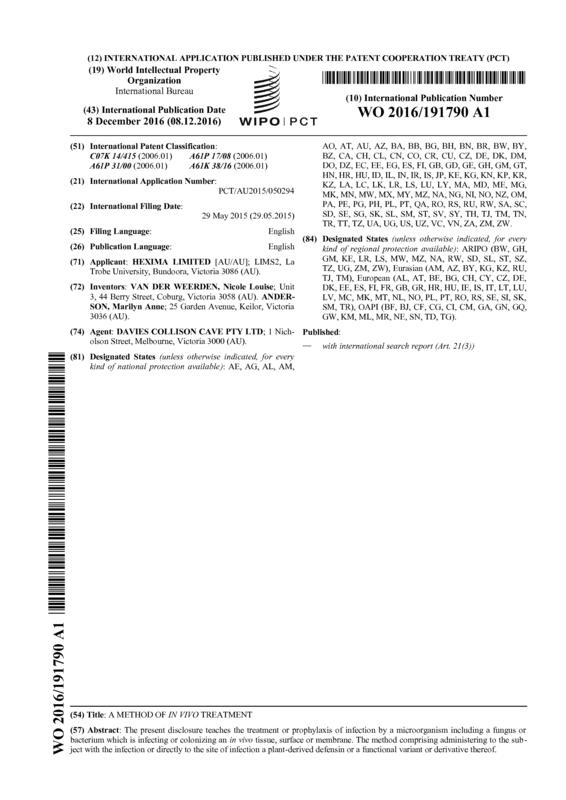 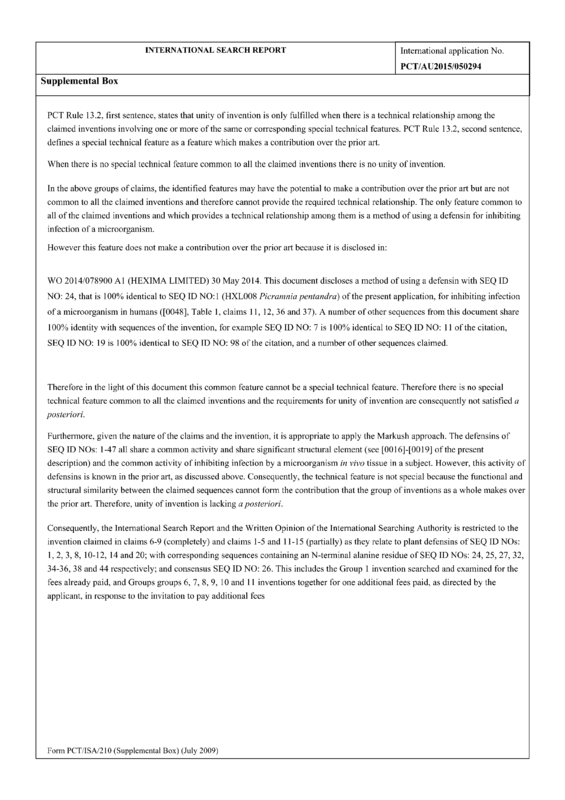 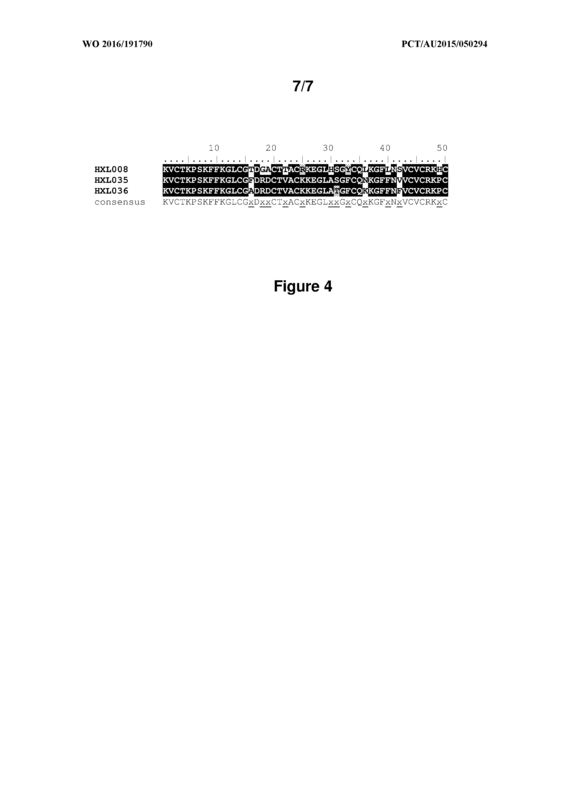 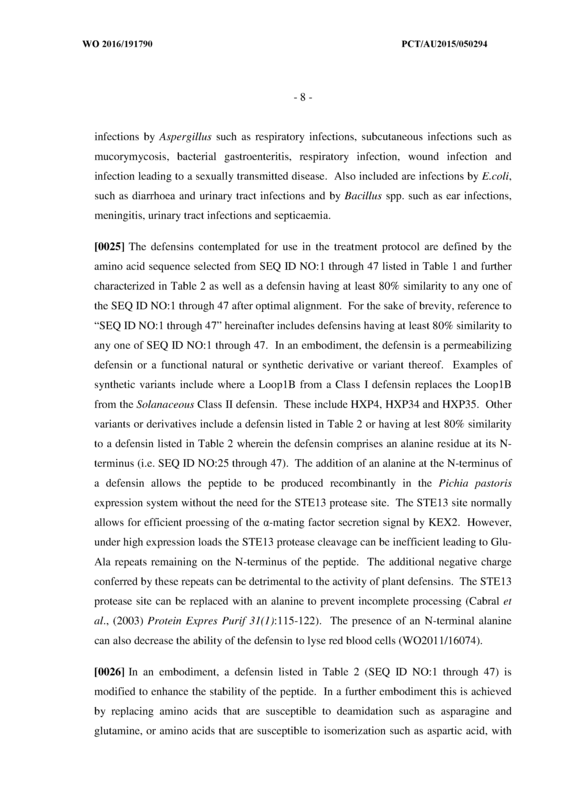 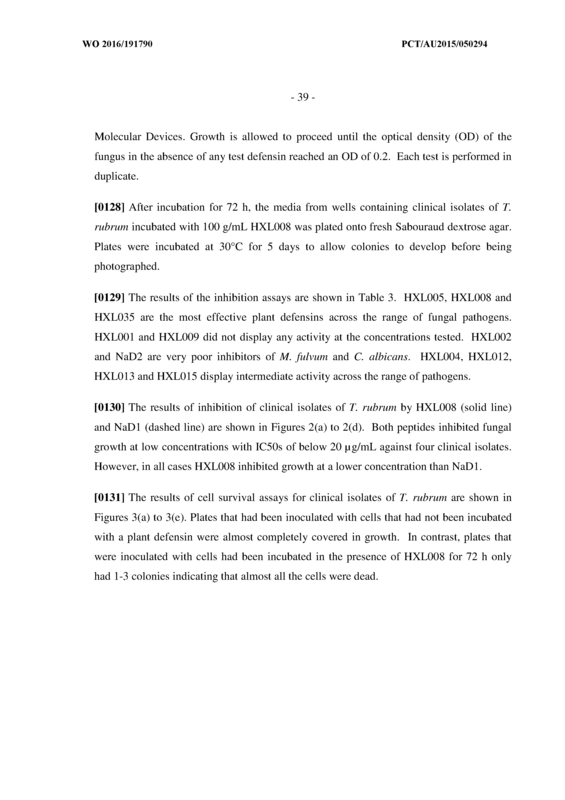 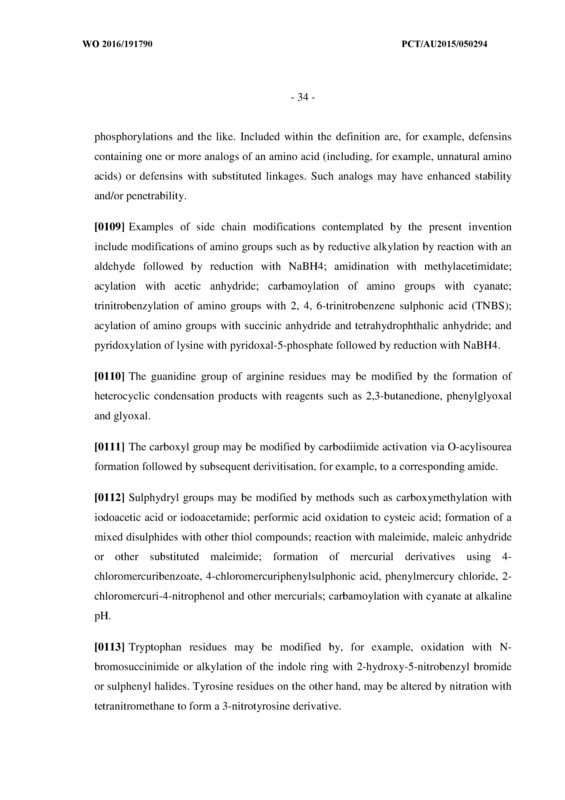 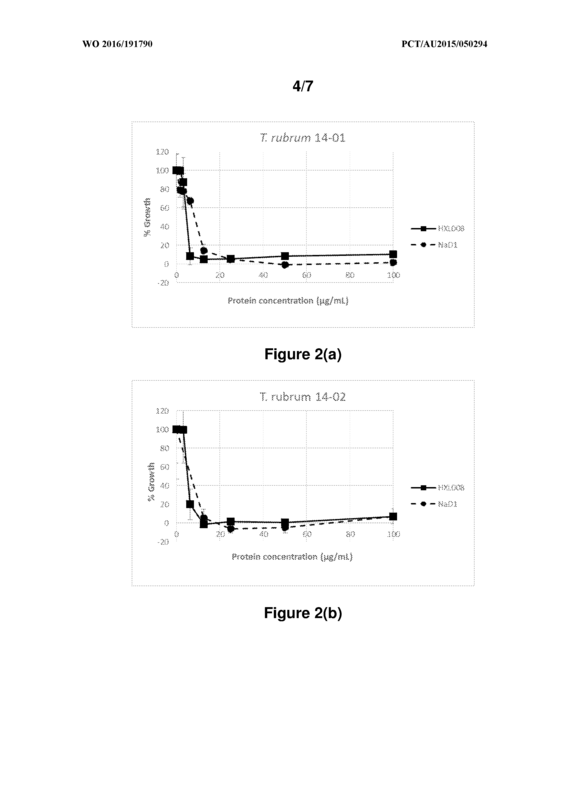 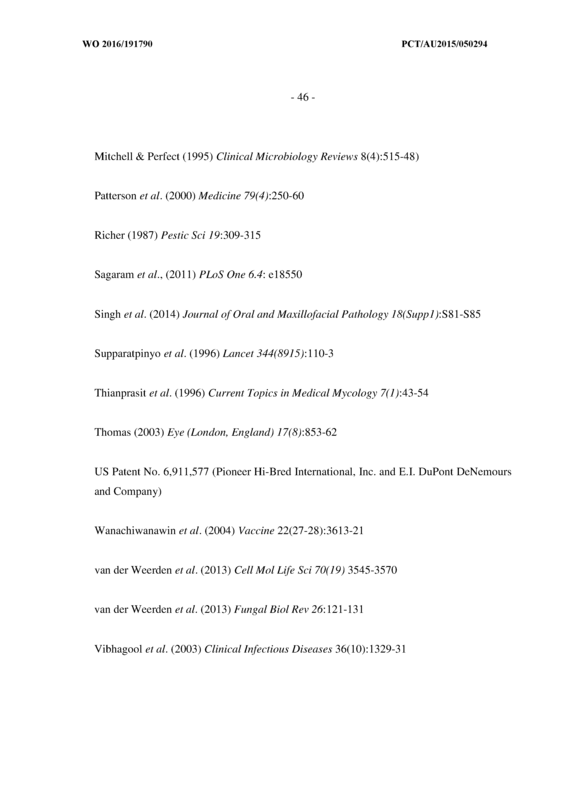 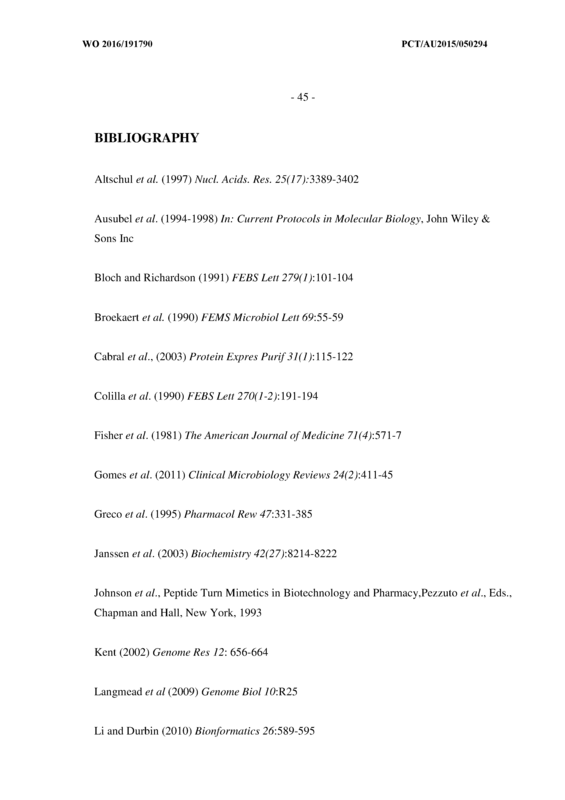 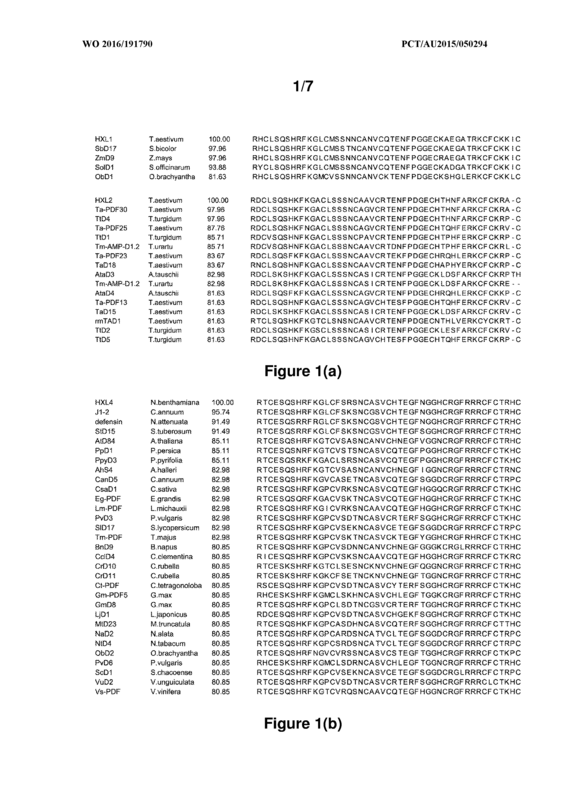 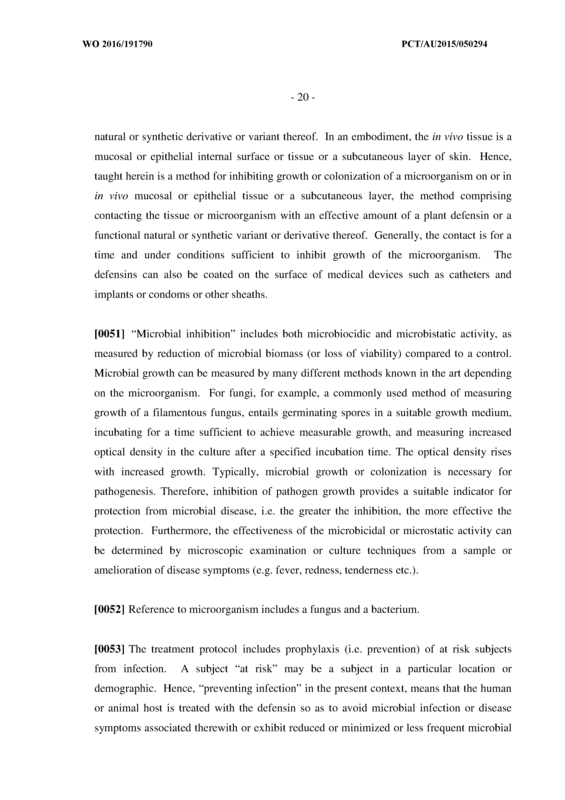 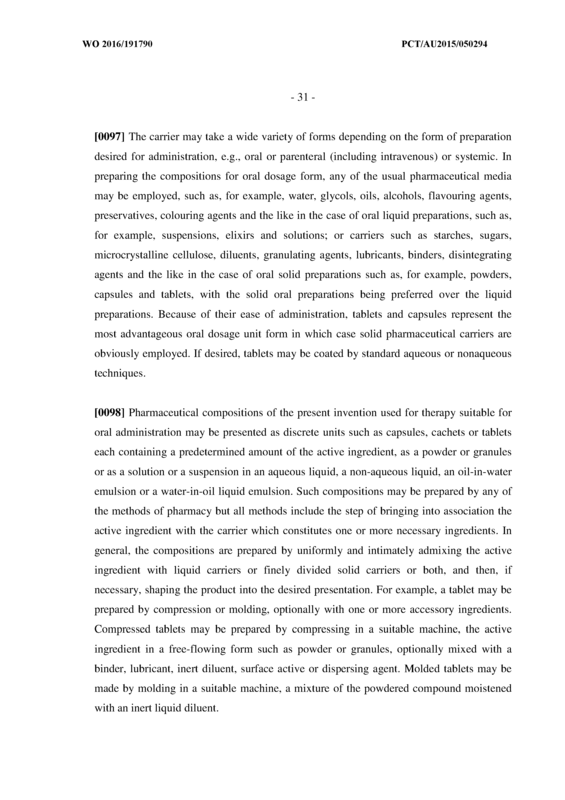 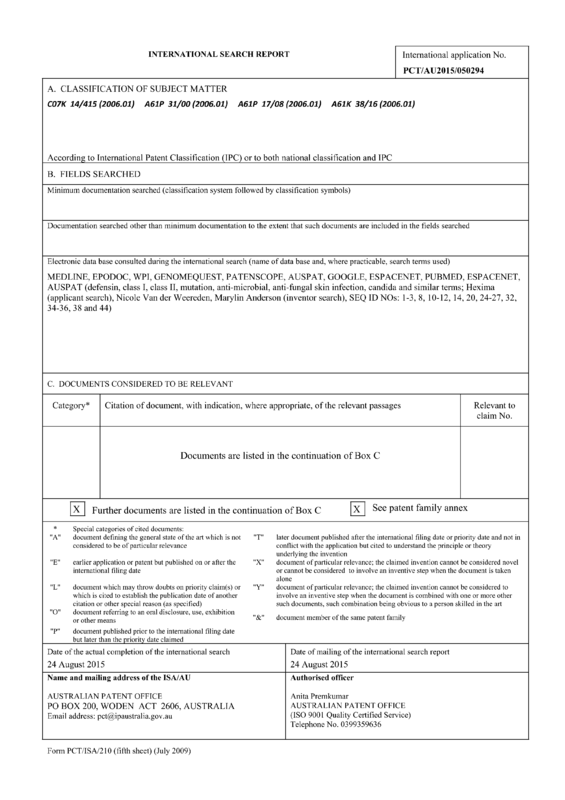 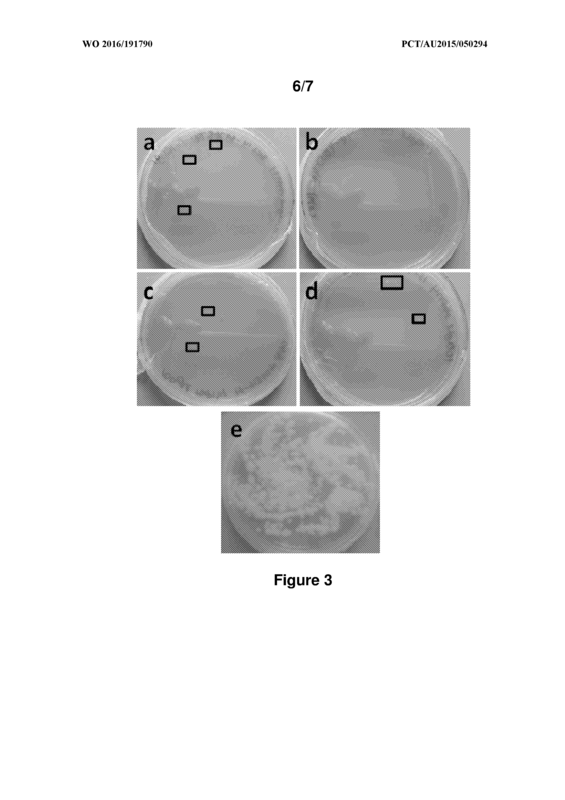 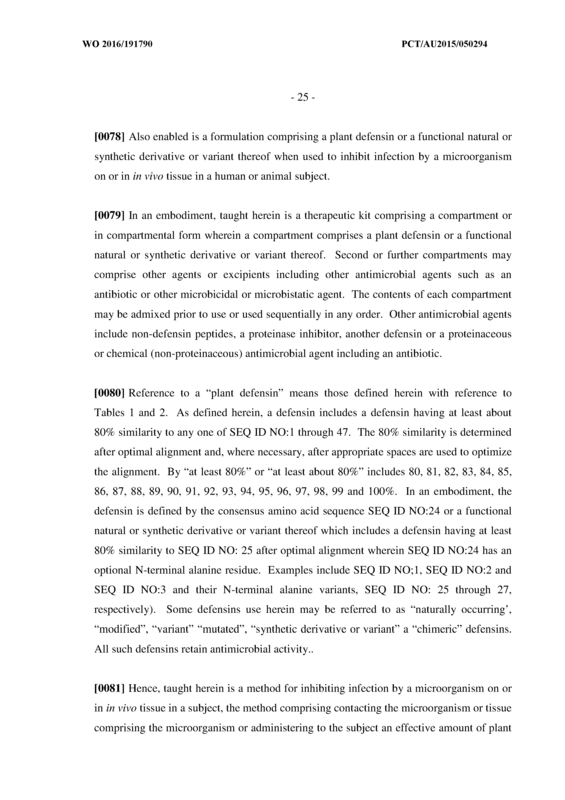 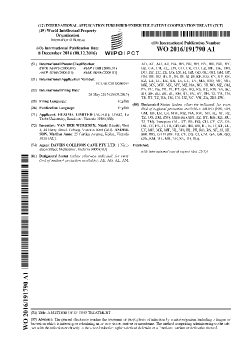 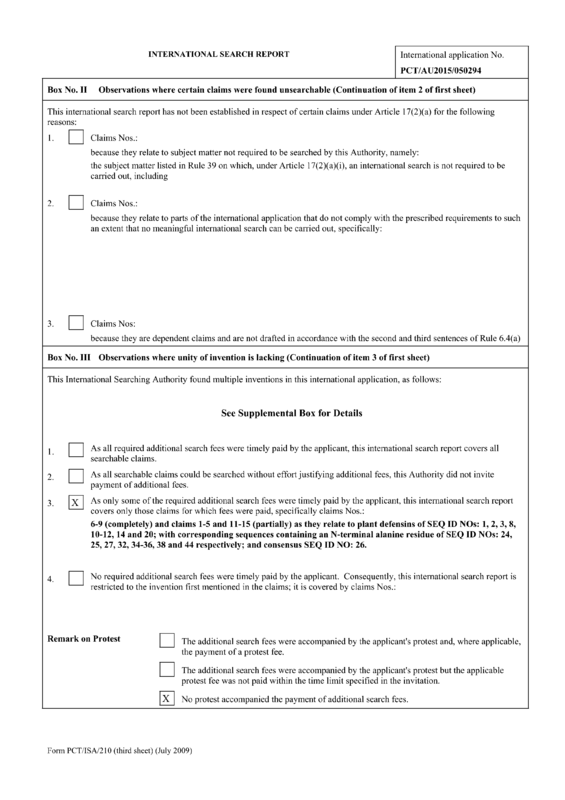 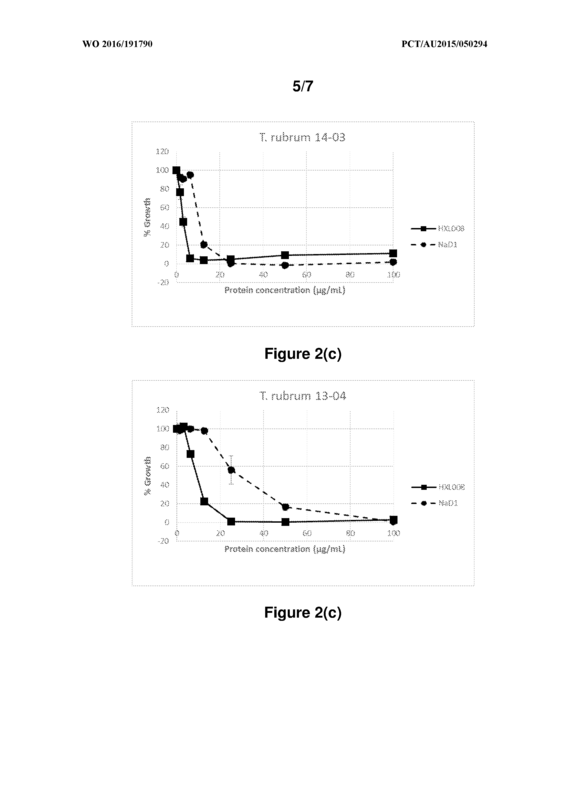 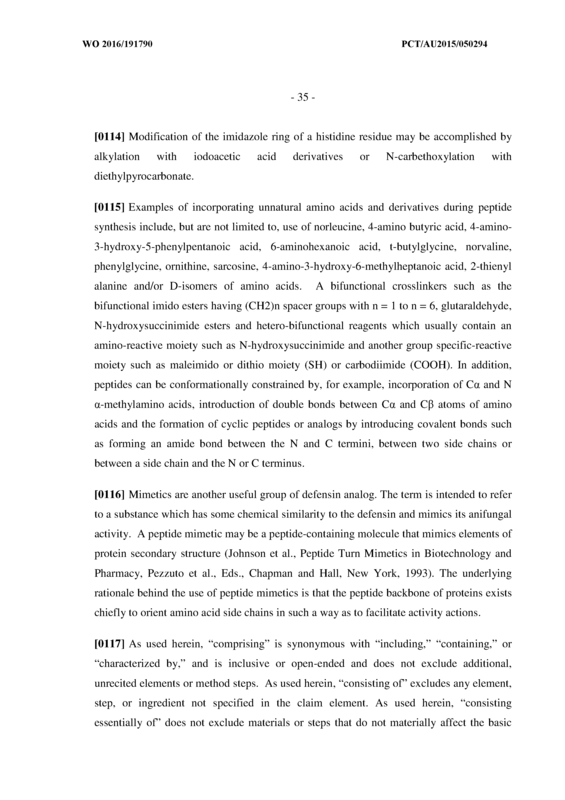 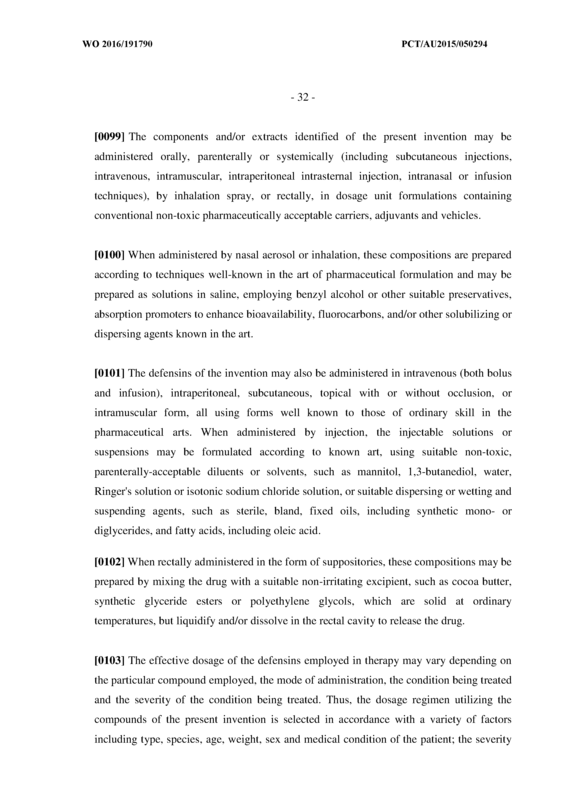 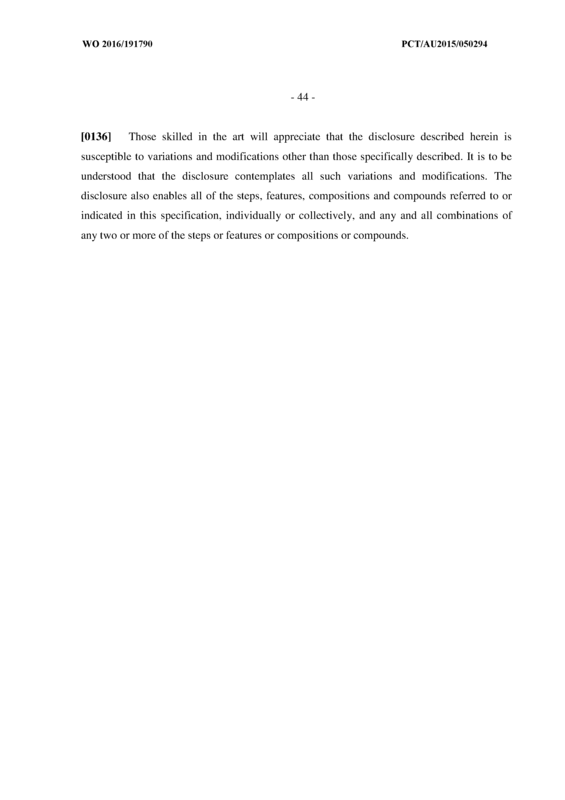 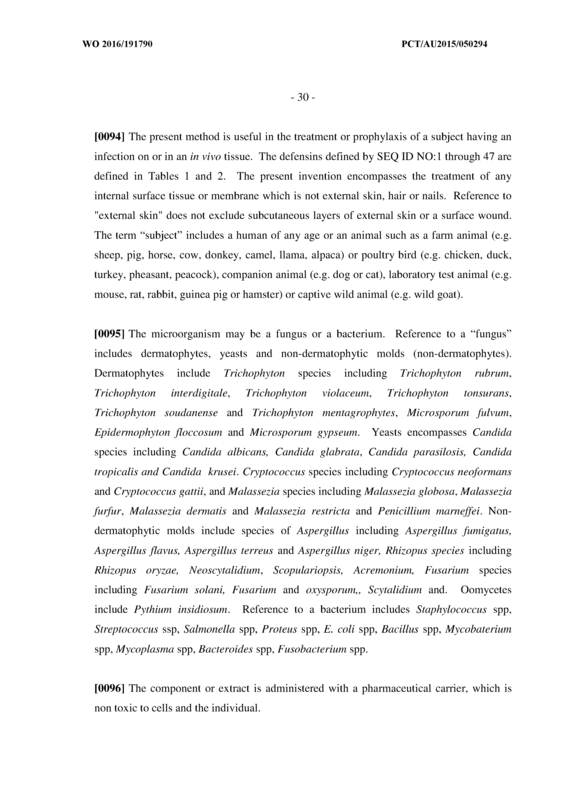 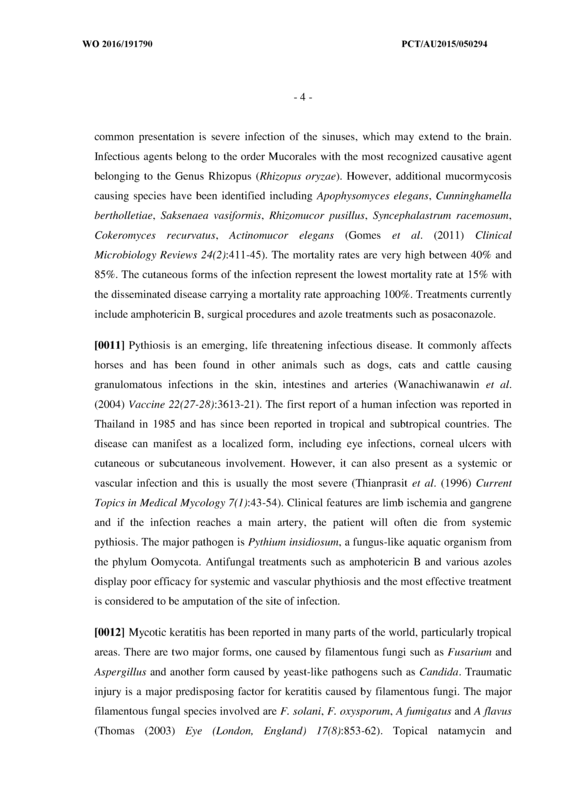 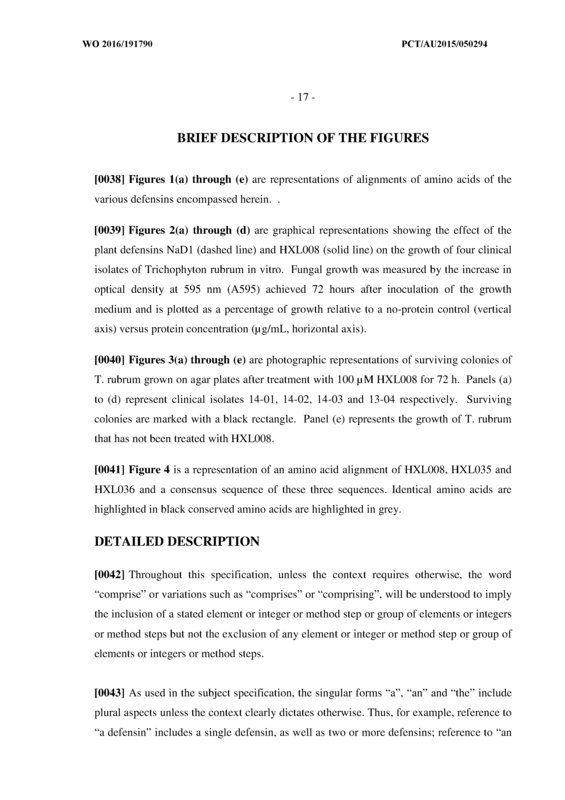 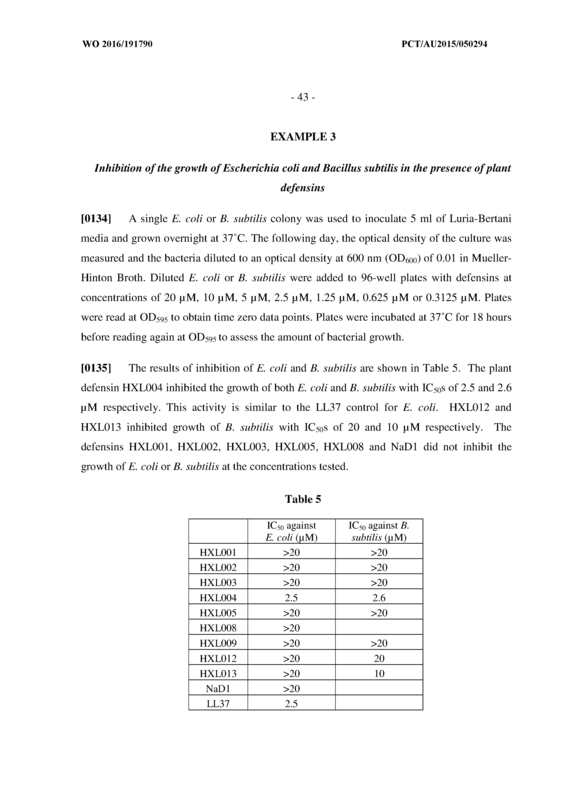 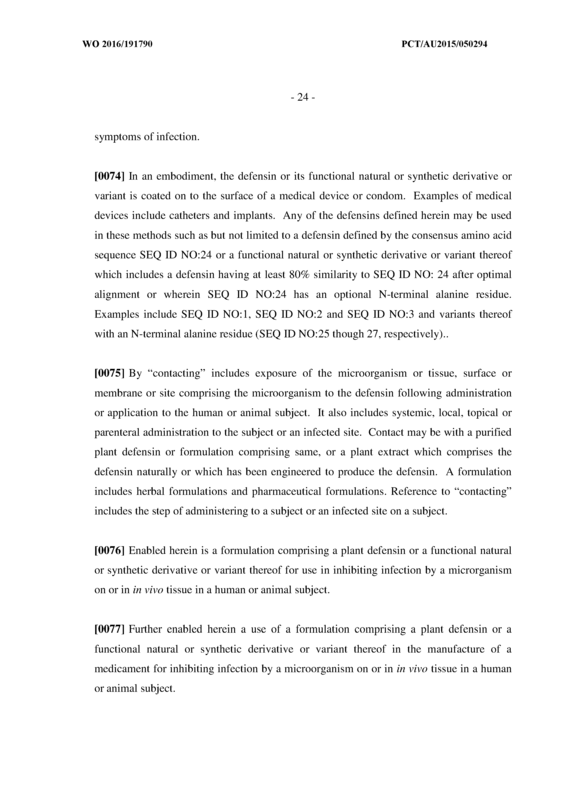 A method for inhibiting infection of a microorganism on or in in vivo tissue in or on a subject, said method comprising contacting the microorganism or tissue comprising the microorganism or administering to the subject an effective amount of plant defensin selected from SEQ ID NO: l through 47 or a functional natural or synthetic derivative or variant thereof or a defensin having at least 80% similarity to any one of SEQ ID NO: l through 47 after optimal alignment for a time and under conditions sufficient to ameliorate symptoms of the infection. 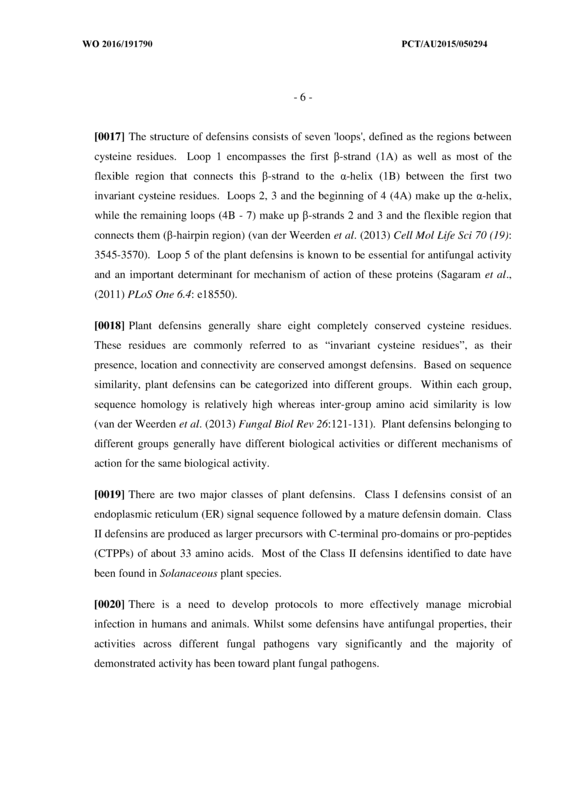 The method of Claim 1 wherein the microorganism is a fungus. 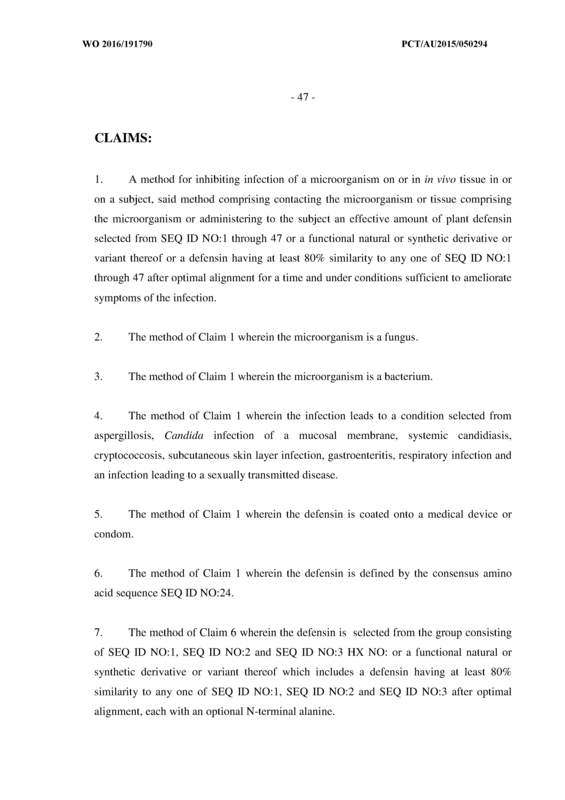 The method of Claim 1 wherein the microorganism is a bacterium. 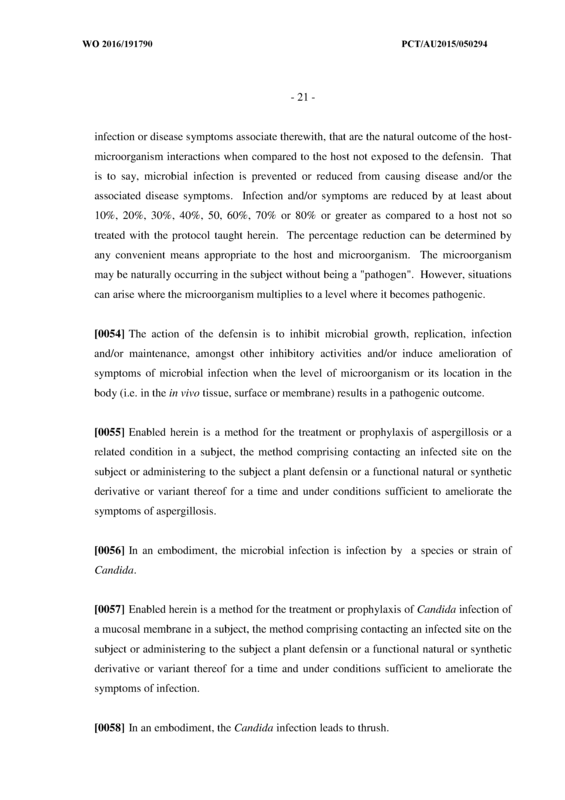 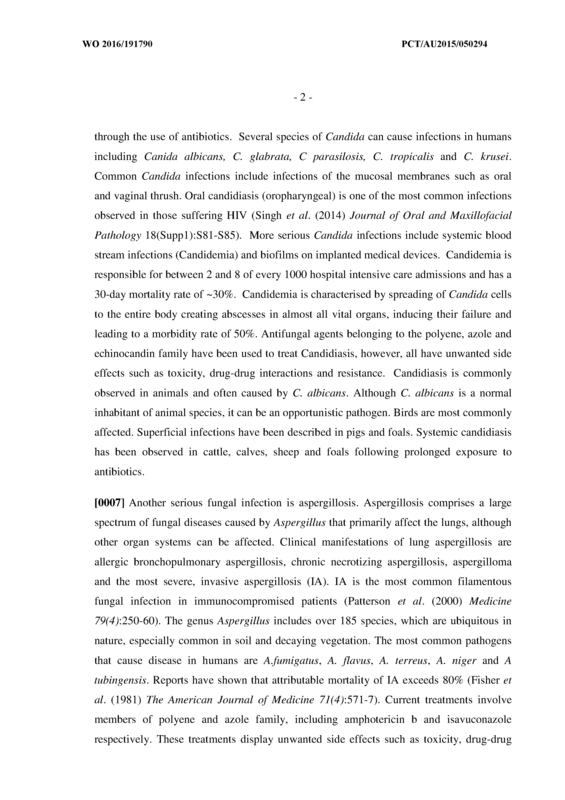 The method of Claim 1 wherein the infection leads to a condition selected from aspergillosis, Candida infection of a mucosal membrane, systemic candidiasis, cryptococcosis, subcutaneous skin layer infection, gastroenteritis, respiratory infection and an infection leading to a sexually transmitted disease. 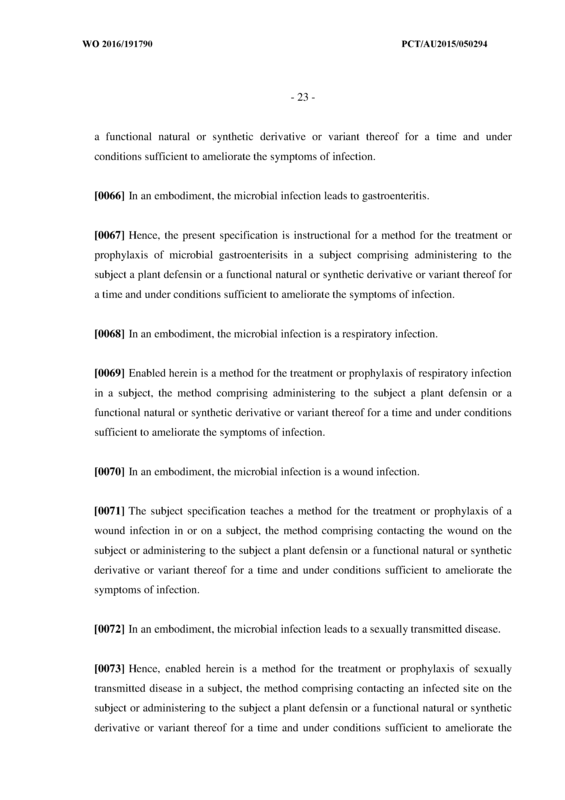 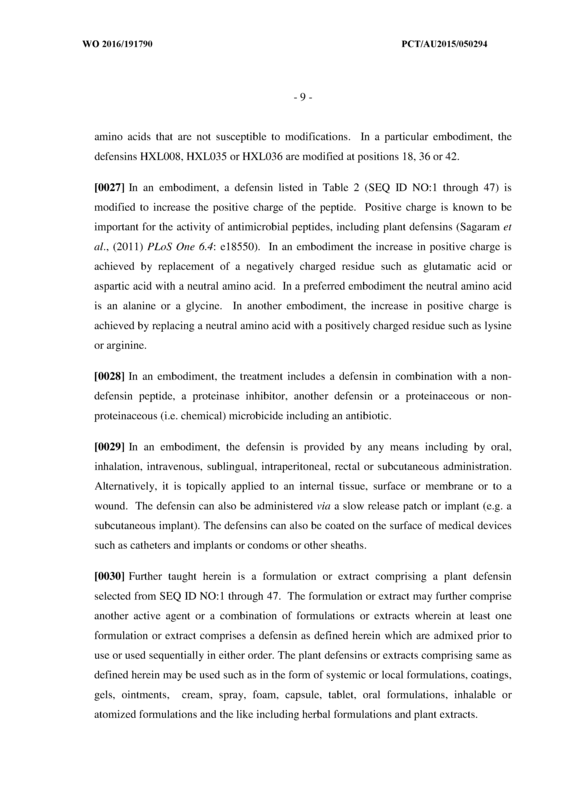 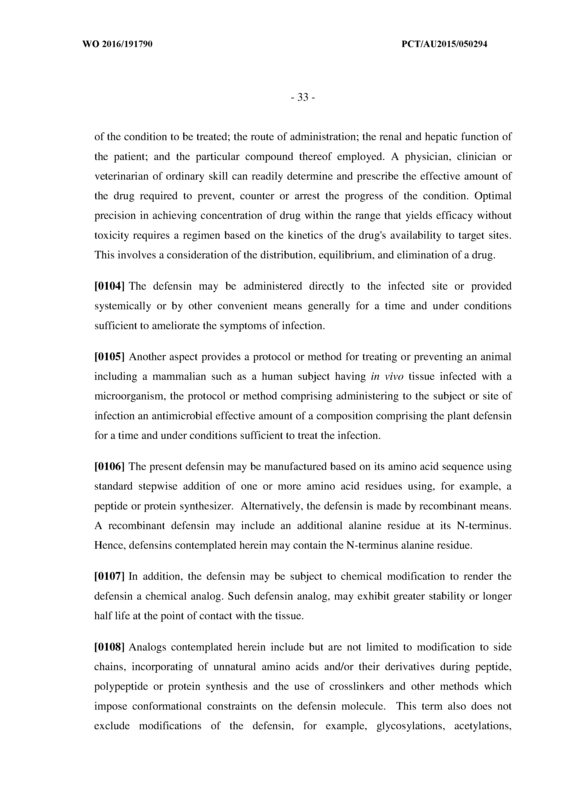 The method of Claim 1 wherein the defensin is coated onto a medical device or condom. 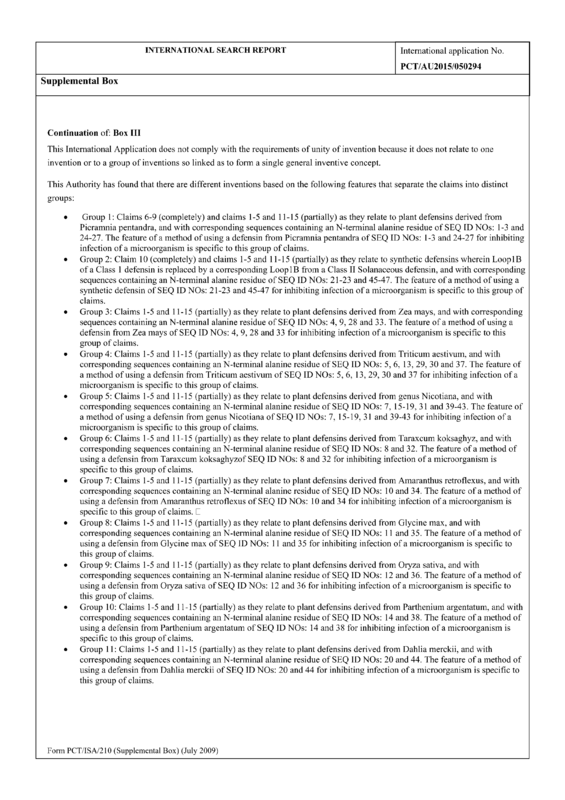 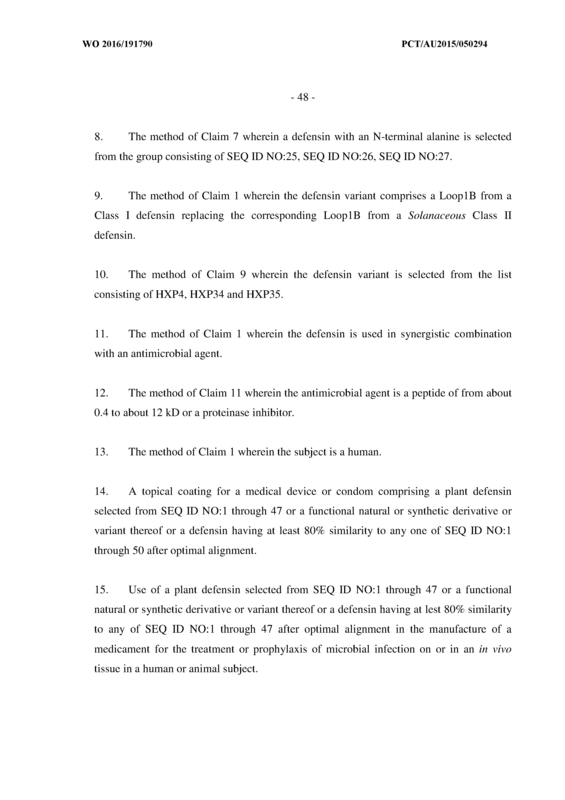 The method of Claim 1 wherein the defensin is defined by the consensus amino acid sequence SEQ ID NO:24. 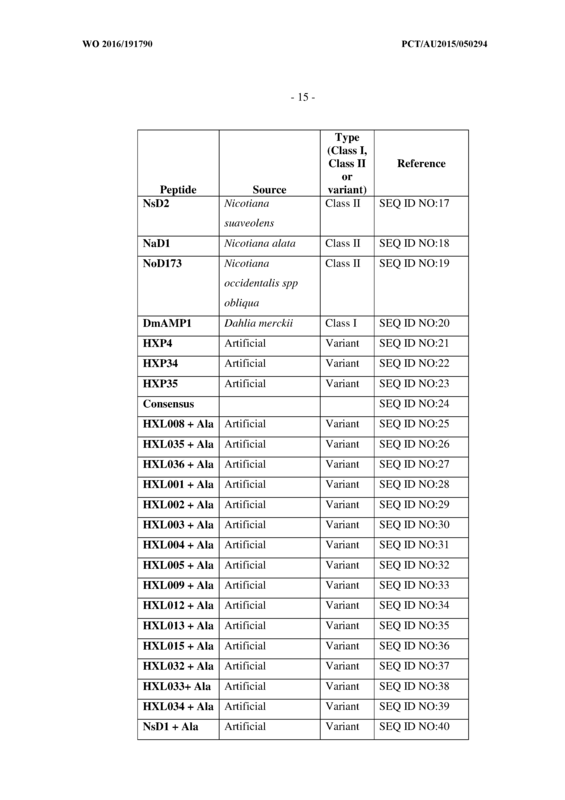 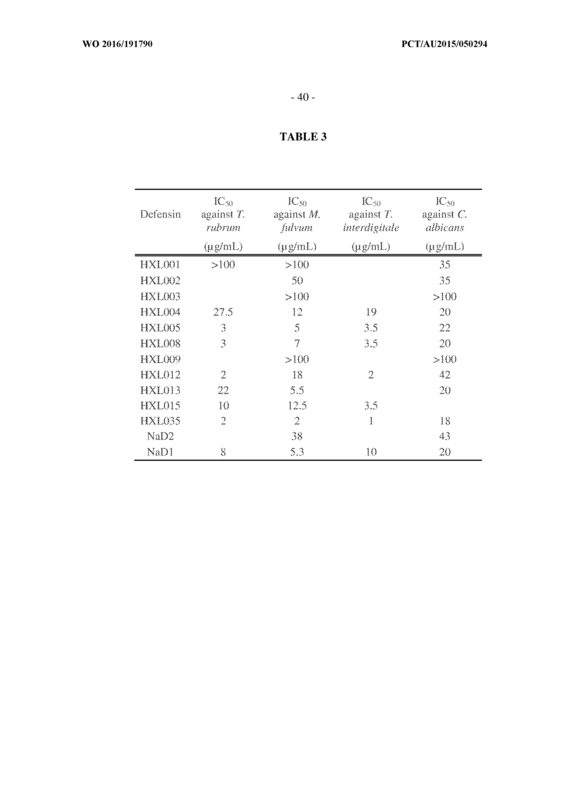 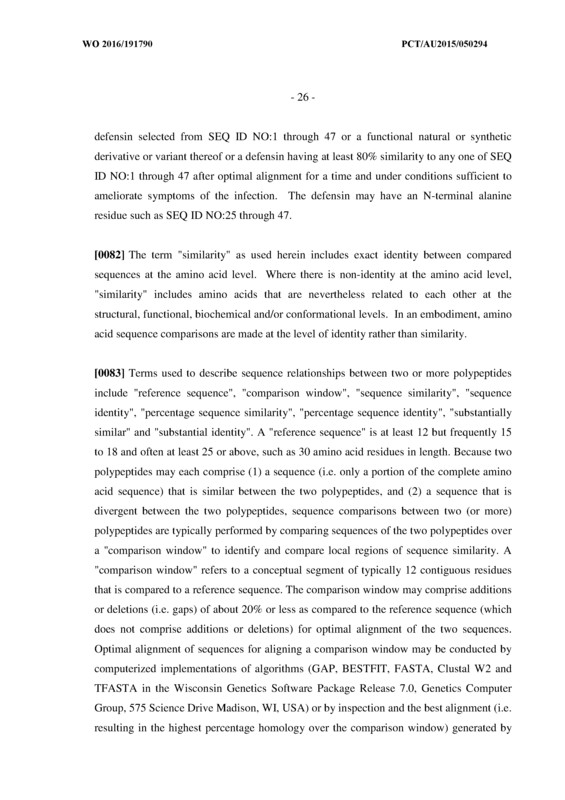 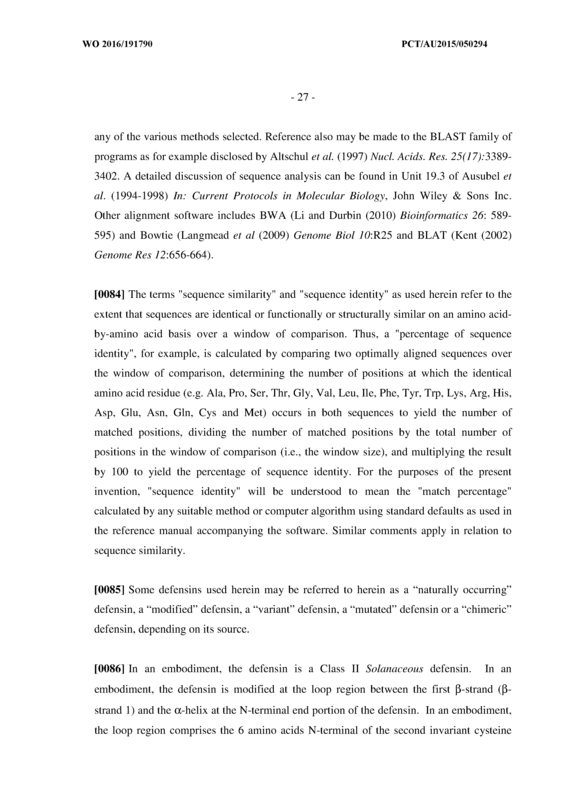 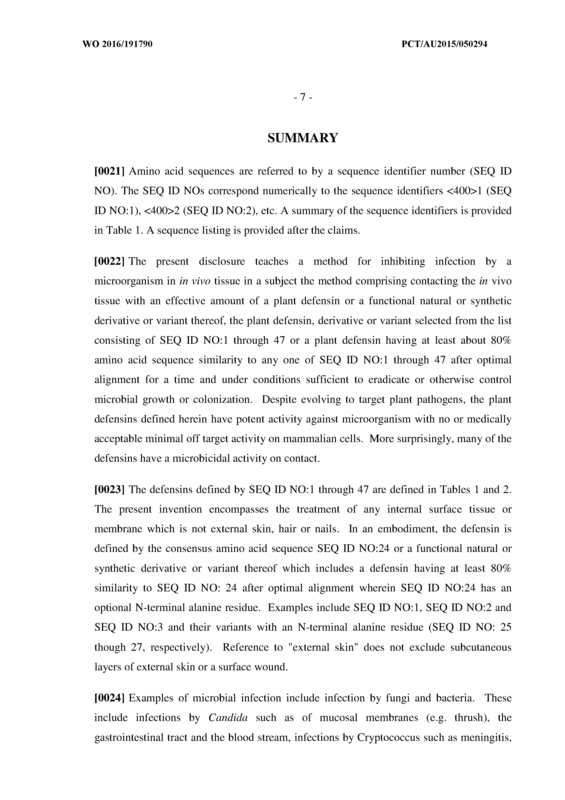 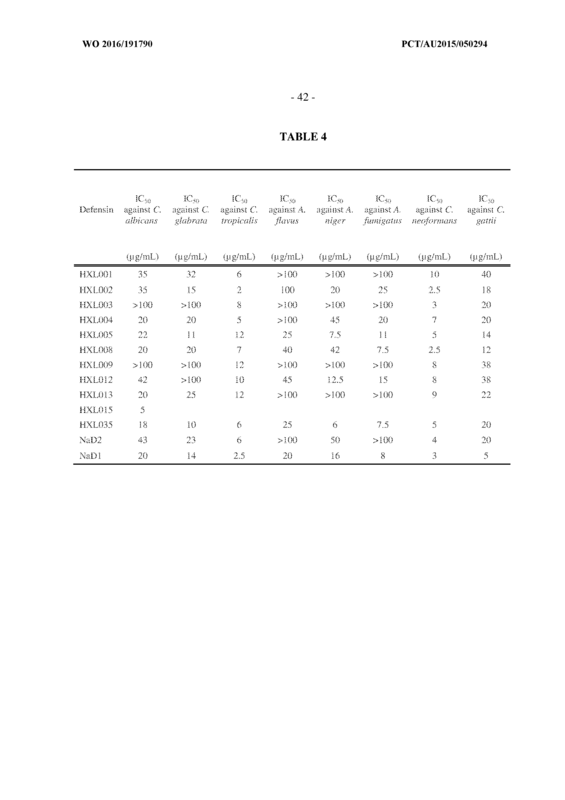 The method of Claim 6 wherein the defensin is selected from the group consisting of SEQ ID NO: l, SEQ ID NO:2 and SEQ ID NO:3 HX NO: or a functional natural or synthetic derivative or variant thereof which includes a defensin having at least 80% similarity to any one of SEQ ID NO: l, SEQ ID NO:2 and SEQ ID NO:3 after optimal alignment, each with an optional N-terminal alanine. 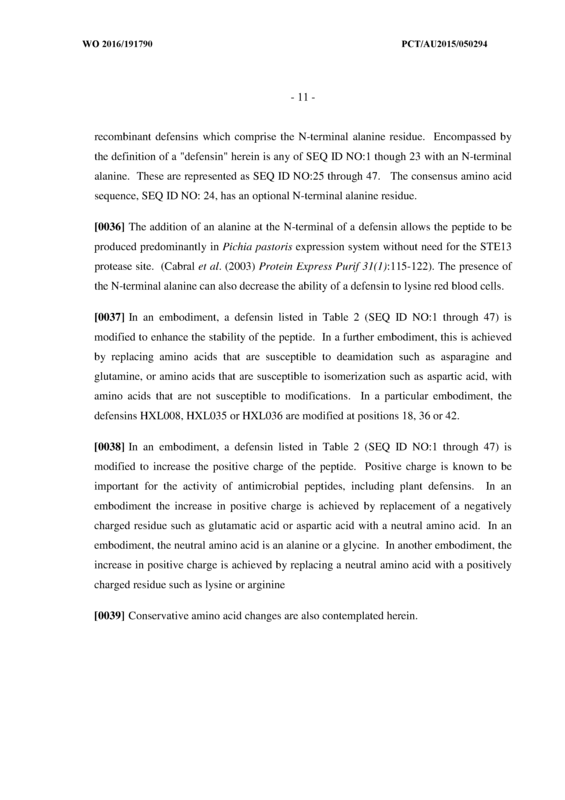 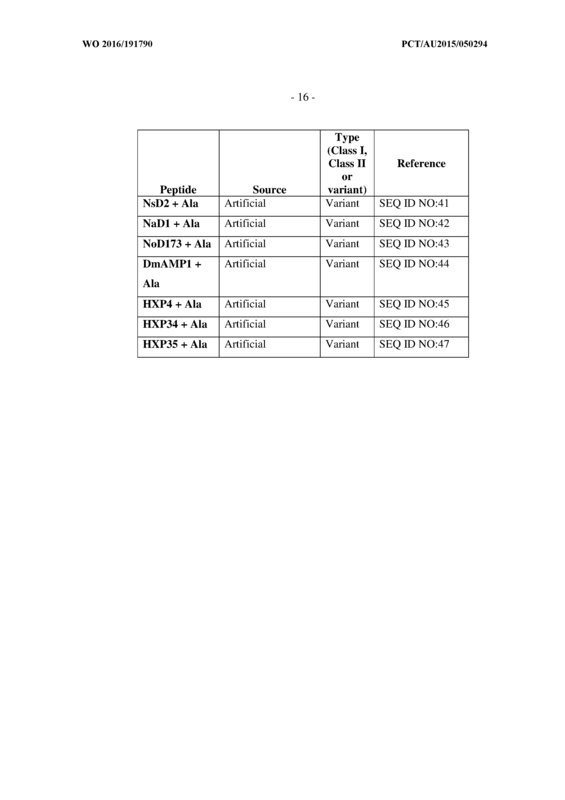 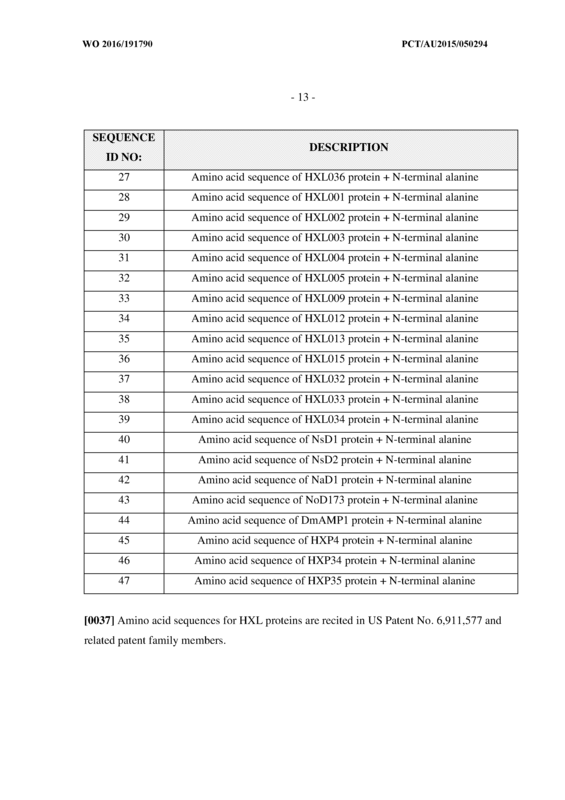 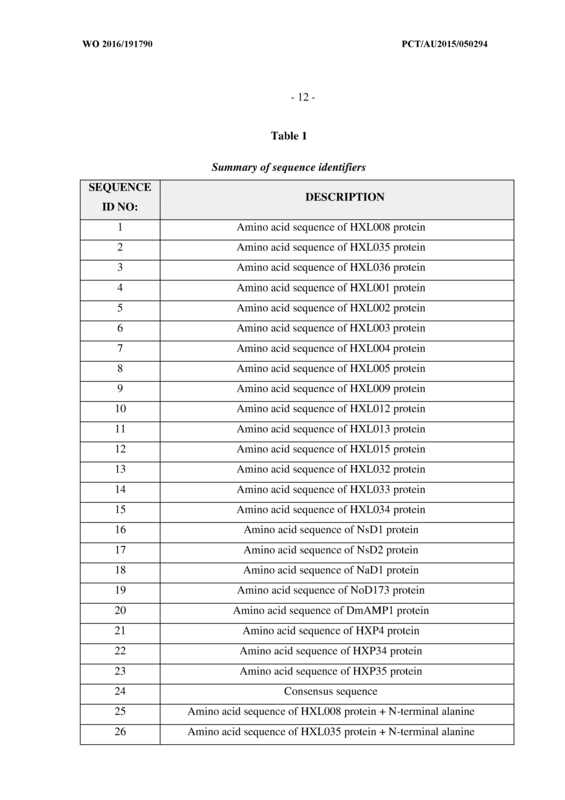 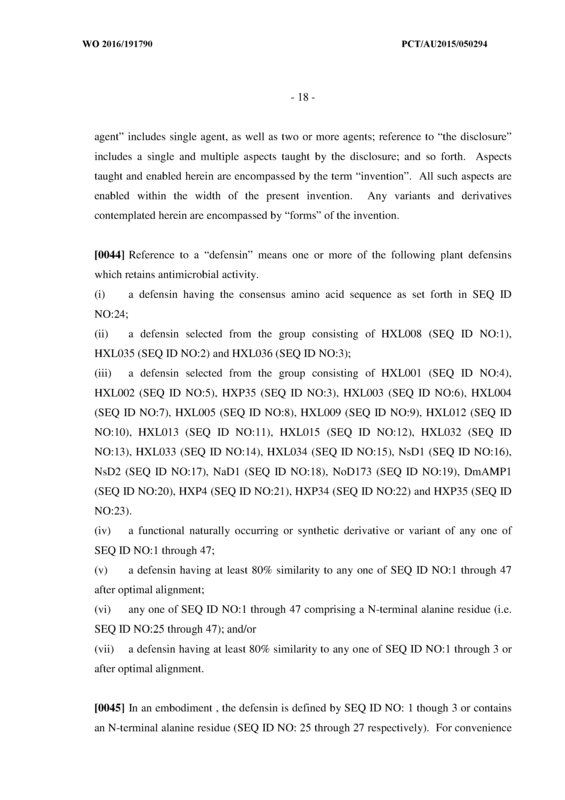 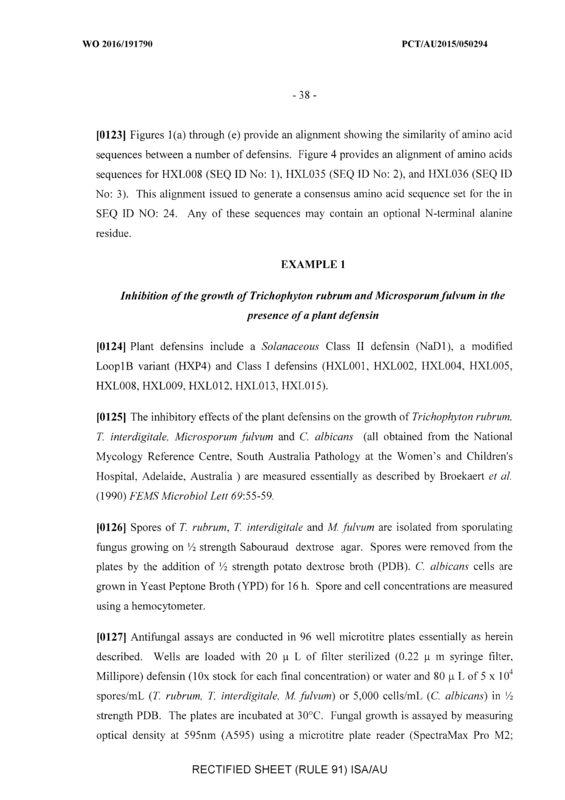 The method of Claim 7 wherein a defensin with an N-terminal alanine is selected from the group consisting of SEQ ID NO:25, SEQ ID NO:26, SEQ ID NO:27. 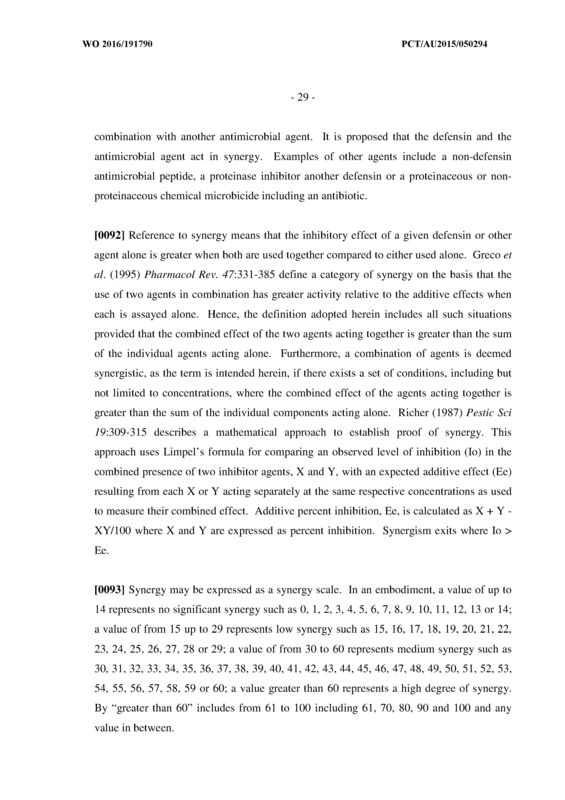 The method of Claim 1 wherein the defensin is used in synergistic combination with an antimicrobial agent. 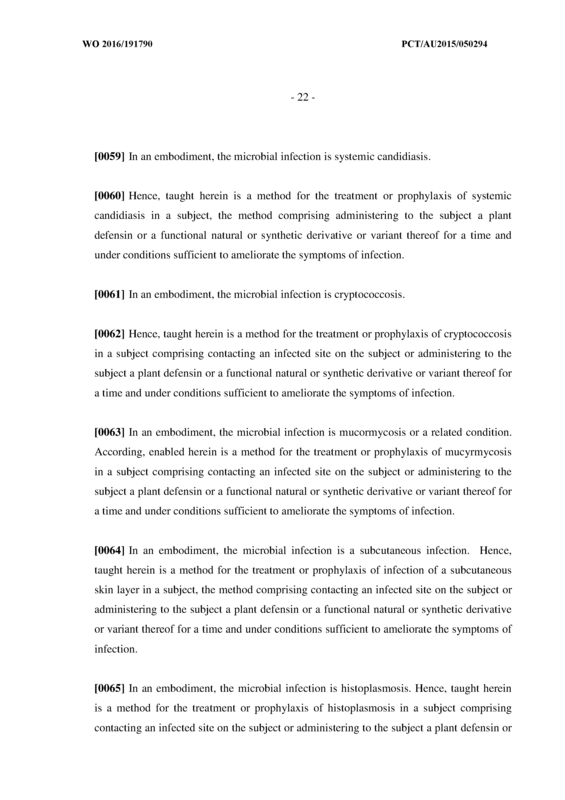 The method of Claim 11 wherein the antimicrobial agent is a peptide of from about 0.4 to about 12 kD or a proteinase inhibitor. 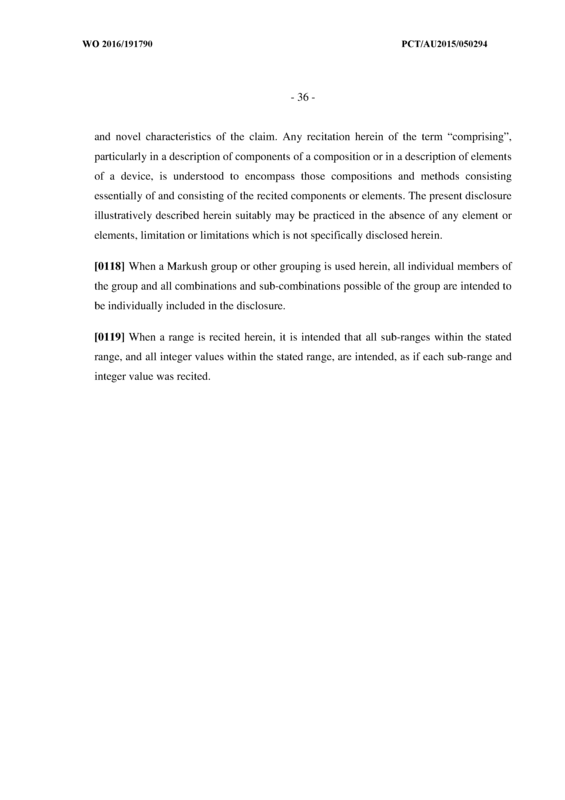 The method of Claim 1 wherein the subject is a human. 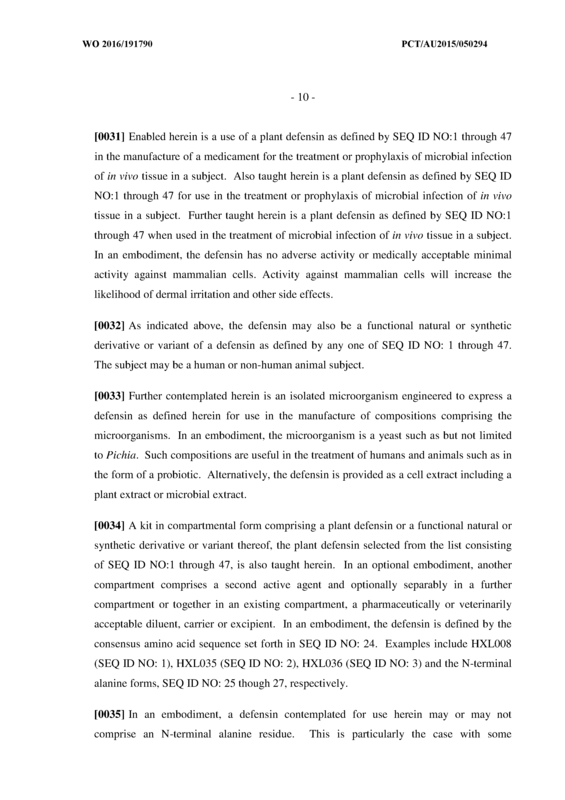 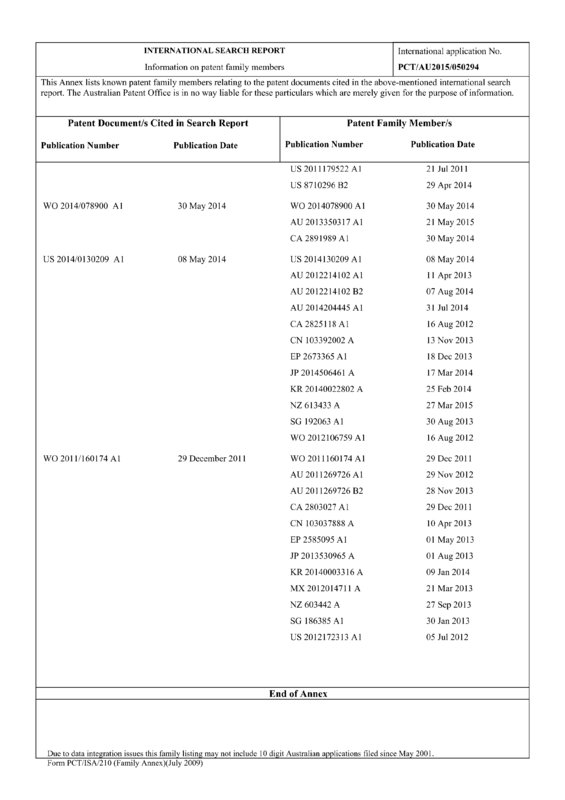 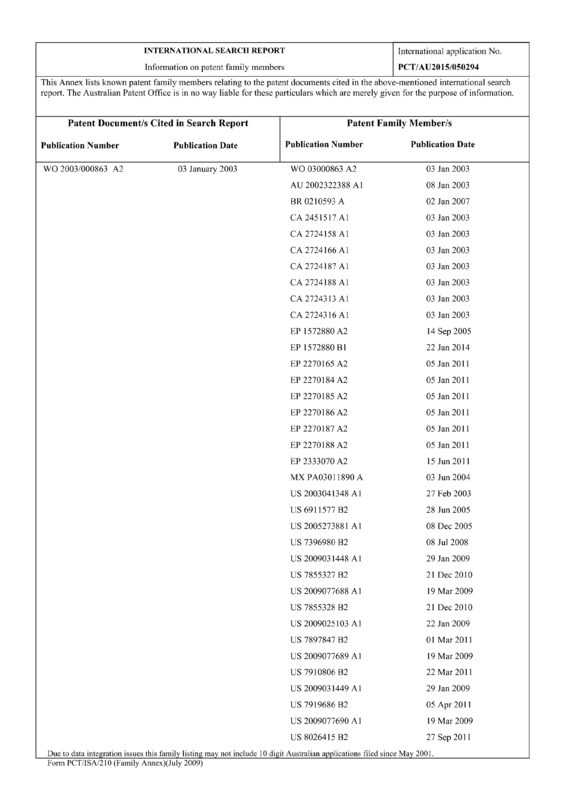 A topical coating for a medical device or condom comprising a plant defensin selected from SEQ ID NO: l through 47 or a functional natural or synthetic derivative or variant thereof or a defensin having at least 80% similarity to any one of SEQ ID NO: l through 50 after optimal alignment. 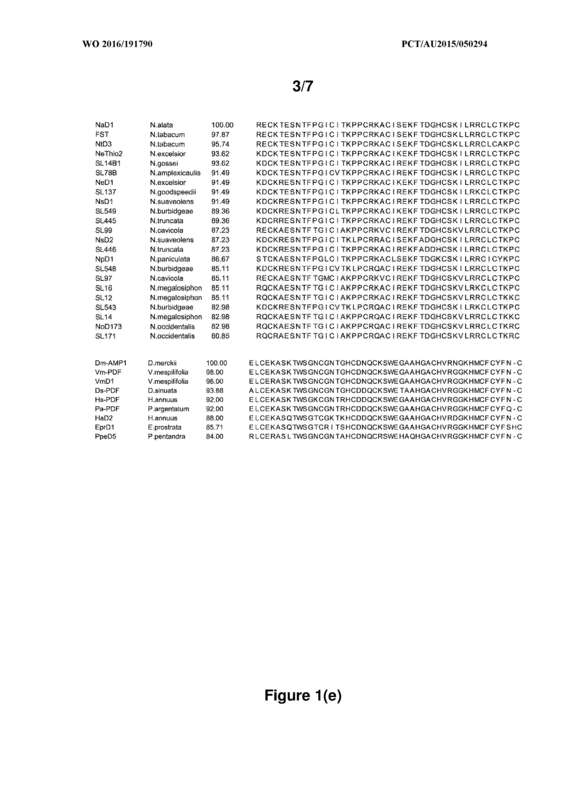 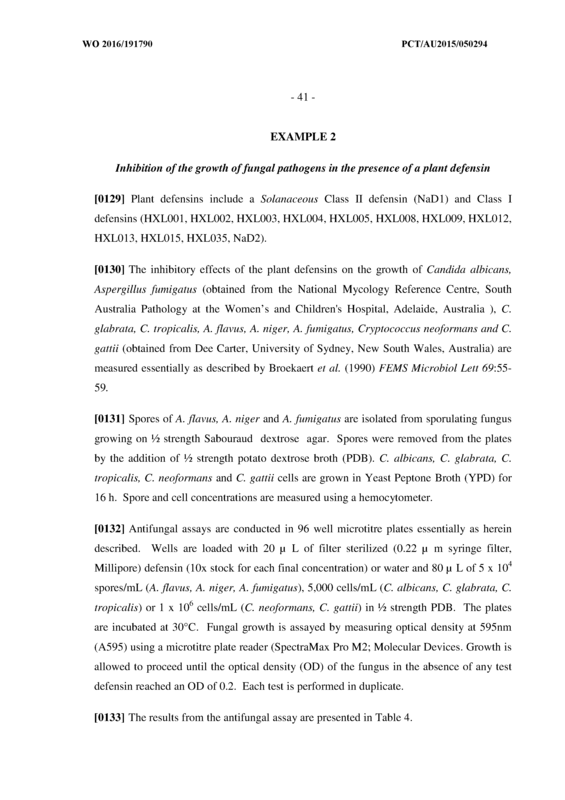 Use of a plant defensin selected from SEQ ID NO: l through 47 or a functional natural or synthetic derivative or variant thereof or a defensin having at lest 80% similarity to any of SEQ ID NO: l through 47 after optimal alignment in the manufacture of a medicament for the treatment or prophylaxis of microbial infection on or in an in vivo tissue in a human or animal subject.